Police in Lehi, Utah are looking into the marriage of TLC star Kody Brown and his four wives. The cops admit that the show's publicity is what prompted the case. According to People, bigamy is a third-degree felony in Utah but is rarely investigated. Lt. Darren Paul says: "At the conclusion of the investigation, the evidence will be forwarded to the Utah County Attorney's Office for review and possible prosecution." 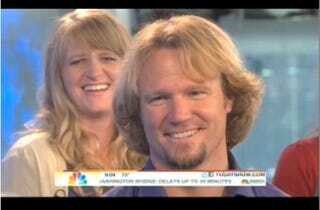 When Kody was on the Today show, he admitted that he is only legally married to one woman, Meri, his first wife — whom he wed 20 years ago. He is spiritually married to his other wives. The Browns and their 12 children are Fundamentalist Mormons, and, as a columnist for The Huffington Post points out, the TV show provides a much-needed paycheck; some "single mothers" in Utah collect welfare. The question is: Is having four wives a legal issue, or one of religious freedom?